Now that the effort to extend federal unemployment benefits appears dead, jobless Americans have only regular unemployment insurance to fall back upon. Those benefits are capped at 26 weeks in the great majority of states (as well as in Washington, D.C., Puerto Rico and the Virgin Islands), acc0rding to data from the Center on Budget and Policy Priorities. The regular unemployment insurance program is funded jointly by the states and the federal government, and within broad guidelines, each state can set its own benefit levels and eligibility rules. Two states allow people to collect benefits for longer periods: Massachusetts (30 weeks) and Montana (28 weeks); seven states, mainly in the Southeast, have set their maximum durations below 26 weeks. Florida stands out as having among the tightest rules in the nation. 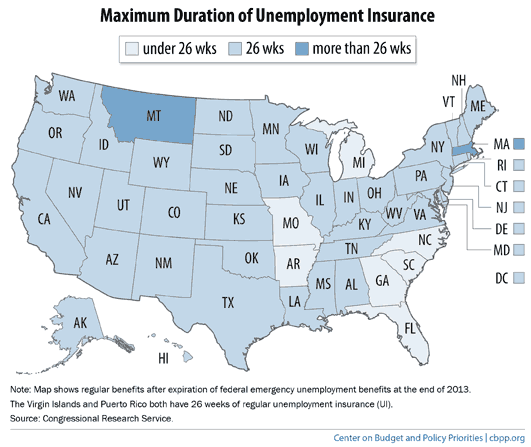 Under a 2011 law, the maximum duration of benefits is tied to the state’s unemployment rate. The time limit was 19 weeks until this year, but because of falling unemployment (6.4% as of November) the maximum dropped to 16 weeks for new claims filed after Jan. 1. The federal “emergency unemployment compensation” program, which made benefits available for as many as 47 weeks on top of the state maximums, expired at the end of 2013. One of the two proposals that failed Tuesday in the Senate would have extended the emergency program for three months; the other would have extended it for 11 months.